Herodotus (born approximately 484 BC) is often referred to as the "Father of History." He was the first writer to evaluate historical, geographical and archaeological information in a critical way. A large part of his writings was about the Persian Wars, Xerxes the Great, and the growth of Persia into a great kingdom. Xerxes the Great was the king of ancient Persia from 486 to 465 BC. 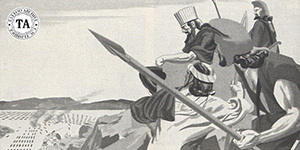 Xerxes was on a conquest and after bringing Egypt back under Persian rule, he struck out to invade Greece. But the Hellespont was in his way. This strait, which was 40 miles long and 1 to 4 miles wide and connected the Aegean Sea and the Sea of Marmara in western Turkey, had to be crossed. Xerxes built a bridge of boats, but as fate would have it, a storm came up and the bridge was destroyed. Herodotus picks up the story here and states that, "Xerxes ordered that three hundred lashes of the whip be inflicted on the water and a pair of shackles be thrown into it. I have even heard that in addition he sent tattooist (stigees) to tattoo (stixontes) the Hellespont. In any case, he ordered his agents to say as they did their whipping, O cruel water your master imposes this penalty upon you for doing him wrong when he had done no wrong to you, King Xerxes will cross you, whether you like it or not." Xerxes the Great did invade Greece and sacked Athens but after the defeat of his fleet in the Battle of Salamis (480), was not able to supply his army. He had to retreat and thus gave up his dream of this conquest.